White marble backsplash - classic subway tiles that will never ever go out of style. Old cabinets made new again - painted a fresh white and dressed with contemporary hardware, these refurbished cabinets probably allowed for splurges else-where. Dark gray counters - I can't tell if they're quartz, concrete, or another composite material, but the color is perfect and the solid-surface means low-maintenance and durability. Old farmhouse sink - I'm not certain if it's the large basin or the nostalgia behind it, but I adore these sinks. Wall-mounted faucet - the perfect fit for the sink, they look shiny and new but still original to the sink. Mounted to the wall, the faucet stands out as a focal point of the room. 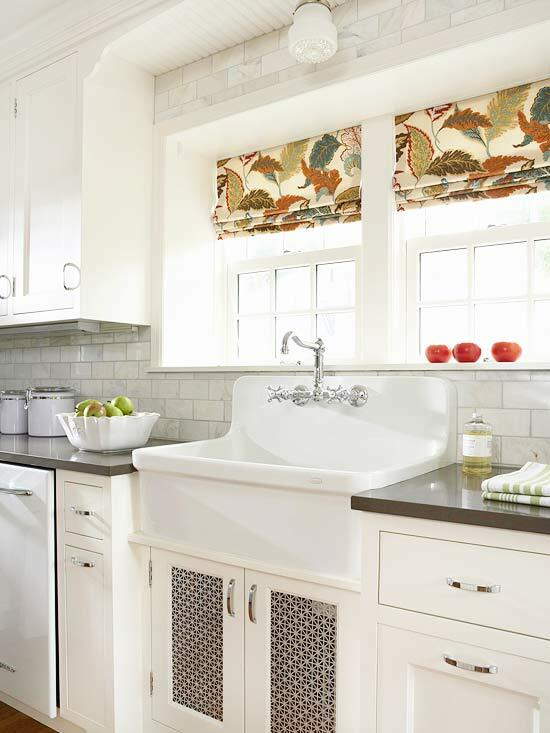 Re-purposed radiator screens - placed in the cabinets below the sink, the silver geometric screen material serves as the perfect accent to the kitchen. Roman Shades - a bright accent fabric livens up the space and allows for a few punchy accent colors, but the streamlined shape keeps things classically refined. Simple ceiling-mount light fixture - vintage, demure, and sweet, it doesn't scream for attention but adds to the clean crispness of the room. Do you love this kitchen as much as I do? What is your favorite part? Do share! Love it all! I think the radiator screens are my fave, pretty unique!